Tokamaks are also the largest and most expensive devices around, by large margin. ITER's main principle for future viability is hope. They hope that once a functioning break even plant is operating, they will learn, and others will learn in other fields, and be able to develop something closer to cost effective/economically viable. The hope I see, is that in some future, where the global economy has expanded beyond earth, the relative cost and scale to build a Tokamak power plant becomes an acceptable fraction of resource expenditure. However, this is predicated that the cost per unit power is comparative or beats other means (not likely in my opinion at this point). The coming Energy Age (as I like to call it) is what will drive human expansion into and beyond the solar system. Without it, we are not going anywhere except some limited forays into the solar system, and fate implies we start and end here in our system. Think of it as a race. We are trying to beat the solar system's, galaxy's, and universe's attempts to kill us by getting out of the way first. Without real sustainable energy to move us around and support us while doing it, it is not going to happen. Our clock will run out. I think that HTSCs like Tokamak Energy and the MIT are planning to use will help making Toks a lot smaller and more economically viable. In addition to this Tokamak Energy will build spherical Tokamaks which can also be smaller. It seems like a good plan, if they can make it work. 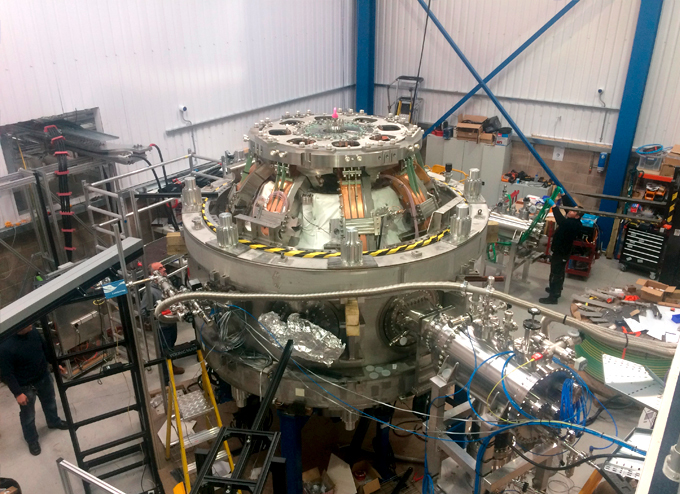 Tokamak Energy has announced that their ST40 is now operational and that they are optimising its performance. I thought they were using HTSCs, why the short shots? We just turn ours on and let it run, which is kind of the point with HTSCs. It looks like they are using conventional coils still, all that work for 3T? I didn't realize how far ahead we were now over a year ago now with a fully operational HTSC prototype. Still on track for a second generation device at 5T by the end of the year. Guess I'll get back to work, will post some pictures soon if I get the chance! They had "ST-25 HTS" running with super conducting coils for 29 hours straight in 2015. ST-40 is starting out with conventional magnets but will be upgraded to HTSCs once these initial tests are complete. My understanding is that HTSCs for this larger Tokamak will take more development work and they want to start testing without having to wait for them to become available. Plus ST-40 is a spherical Tokamak, which puts some constraints on the available space that they can use. So they might need more time to make all that fit together. If I understand the updated (and less precise) timeline on their website better, they will start using HTSCs some time after 2020, which also seems to be when they will attempt to reach break even. Their original timeline was more optimistic and put Q>1 before 2020, but I guess they realized that they would not be able to keep that date. Ok thanks for the info! I hope they are able to upgrade their current device, that would save a tremendous amount of resources. I wish them the best of luck. tannerhorne wrote: Ok thanks for the info! I hope they are able to upgrade their current device, that would save a tremendous amount of resources. I wish them the best of luck. Yes, that is the plan from what I understand. They are just starting out with the conventional magnets for now. Of course plans can change and they won't know whether the HTSCs will fit in the place of the conventional magnets until they get around actually building those things (which I assume will take them a couple of years at least). Tokamak Energy has issued a press release stating that they have reached their milestone of creating a plasma with a temperature of 15 million degrees in the ST40 tokamak. Their next milestone is to create a plasma with a temperature of 100 million degrees. The plasma density would be interesting to know, but that is not mentioned. The ST40 is described on their home page https://www.tokamakenergy.co.uk/st40/ and their overall plans are shown in this hard to read time line graph https://www.tokamakenergy.co.uk/mission/. I think they want to get to 100 million degrees this year. They indeed don't mention density. I suspect that the density aspect won't be reached until they add the HTSCs, which will be in the 2023 to 2024 timeframe, if I interpret their timeline correctly. This would be a significant shift to the right, btw. Originally, they planned to reach that milestone by 2020. According to their latest video their next milestone is 100 million degrees, but they will move the ST40 to a larger building and upgrade it. We will see whether reaching the next milestone happens during this year or not. crowberry wrote: According to their latest video their next milestone is 100 million degrees, but they will move the ST40 to a larger building and upgrade it. We will see whether reaching the next milestone happens during this year or not. Yes, the move to a new building is interesting. I wonder why they are doing that at this stage. General Fusion moved also when they were growing in number of persons. Tokamak Energy has now about 40 people in their team according to their web page. You can see from the picture of the surroundings of the ST40 that the space is already quite crowded. When you raise the temperature to fusion relevant values and run on deuterium, then you will produce those 2,45 MeV neutrons that needs some protective shielding. In the present location there is not enough space for that.